thought catalog published my nonfiction piece 'how to survive a car accident'. Much thanks and gratitude to TC and to its senior editor Brandon Scott Gorrell. 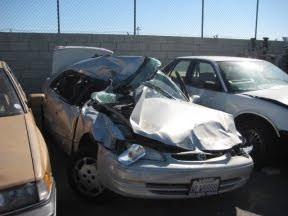 The photo to the right is the totaled car, where I sat in the passenger's seat. I also have a photo of myself and my injury during the accident. A few days ago, I booked my flight for Seattle. It was one of my favorite moments in recent memory. 1 // YOU WERE MISSING, AND I WAS HALF DEAD, BUT IT STILL CAME TO PASS by Frances Dinger @housefire here. 2 // Frank Hinton reads books and things here. 3 // TONGUE PARTY by Sarah Rose Etter is now available @caketrain here. 4 // DURING MY NERVOUS BREAKDOWN I WANT TO HAVE A BIOGRAPHER PRESENT by Brandon Scott Gorrell is available @muumuu house here. 5 // STIGMATAVISION 1 : HOLY FOOL by Kate Durbin here. 6 // may edition of brightstupidconfetti here. 7 // GREEN GIRL by Kate Zambreno has a 'Godard kind of poster feel' cover here. 8 // Theme Park Mini - Day by Dennis Cooper here. @steve i am moving there to live, man. live lief. @stephen thank you, mang. yours is too.